December was so much fun I’m finding it difficult to get back into routine. Sadly, the decorations are packed away and my house is a bland, empty shadow of it’s holiday glittery self. I’m also paying for all the wonderful, but not so healthy food I enjoyed from Thanksgiving until New Years. Like migas from heaven made with a bacon grease base. On one of the more exciting weekends, my Texas-Montana-transplant-friends Cliff and Mari came to visit and make us their favorite breakfast. Migas. Now, I make migas at home. Well, I make northwestern migas; chopped corn tortillas fried up with a little extra light olive oil tossed with eggs, sautéed peppers and onions and a light sprinkle of cheese. They’re decent, but Cliff’s migas are a whole heck of a lot better than mine, probably because he’s a real Texan, instead of a wannabe like me. Or maybe it’s the bacon grease that wins. I’ll share Cliff’s recipe in the next day or so, but be forewarned. It isn’t diet food! Unlike this little sandwich, which I’m going to be eating for the next month while I lumber away on my treadmill. An easy lunch option, serve as a sandwich on good whole grain bread or over a bed of spinach. 1. Place chicken in a medium sized bowl and cut up any large chunks with a fork. Slice celery into three long thin strips then cut sideways into a dice. Cut apple into very thin sliced then into bite size pieces. Place celery and apples into the bowl. 2. Mix in the rest of the ingredients and salt and pepper to taste. Serve on bread or over a bed of spinach. Oh that looks delicious!! I've never had apples in my sandwich before. Also so simple to make. And at least you've put your decorations away, we've still yet to take ours down! It's terrible I know. 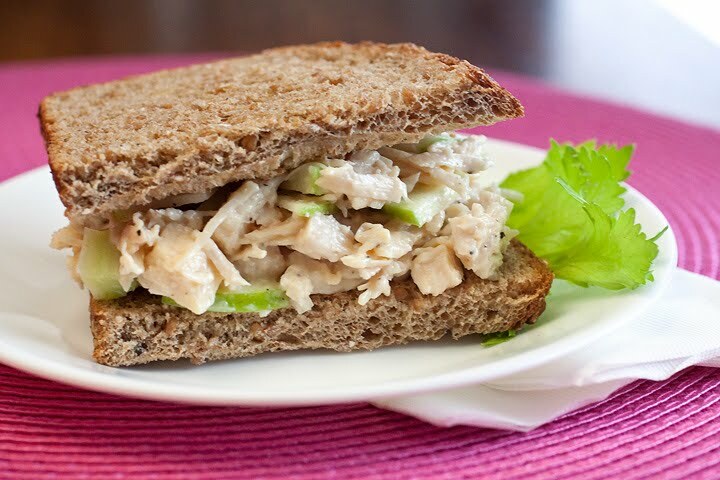 There's something about the simpleness of a chicken salad sandwich.... and when you throw in apple, well that takes it up a notch! Have you ever added walnuts? Oh, and Sharon, our decorations are still up too.. my bad. Oh I'm so sad to say that I need recipes like this now too. But oh it sounds so good.... a great way to make a tasty/healthy lunch. PS ~ I literally just hit send on an order for a treadmill! Seriously hoping that getting serious about exercise will help all that food enjoyment over the holidays. :-) Hope you're having a great start to your new year. I gain way too many pounds over the holidays so this recipe will be in my weekly lunch menu. Oh how I wish the holidays could go on forever so that I could eat guilt inducing food and blame it on the season and the red/white everywhere! Oh well. This sandwich does look delicious! I've never added ginger to chicken salad - sounds like a good add. Hope you had a great New Year!! This sounds so perfect! Like it would cut through the sugar-logged film on my palate! It sounds fresh and flavorful. Just what the doctor ordered after the past two weeks! This certainly looks delish Laura...and INVITING! Have a wonderful New Year! Sounds tasty! The ginger is a new addition for me:) I had so many sweets, I should probably leave out the bread:) BTW, I JUST took my tree down! I adore chicken salad with apples in it...the crunch and the sweetness is to die for! I can't wait to see the recipe for Cliff's migas (they are so popular here in Austin!) Thank you for sharing this plate of wholesome goodness. I hope you have a beautiful Hump Day! i am so intrigued by the ginger in this recipe.. this is a must try:) thanks for sharing this and have a great day. Love this! Especially with the ginger. How interesting. Good luck on the treadmill! (Gah those things are my nemisis). I can so picture this for lunch! My oldest daughter is a chicken salad fanatic - have to try the ginger! Happy New Year and Happy Cooking and Photographing in 2011! This sounds like a healthy tasty meal! Happy New Year! Not that you need it, but I awarded you the Trendy Blog Award over at my site!